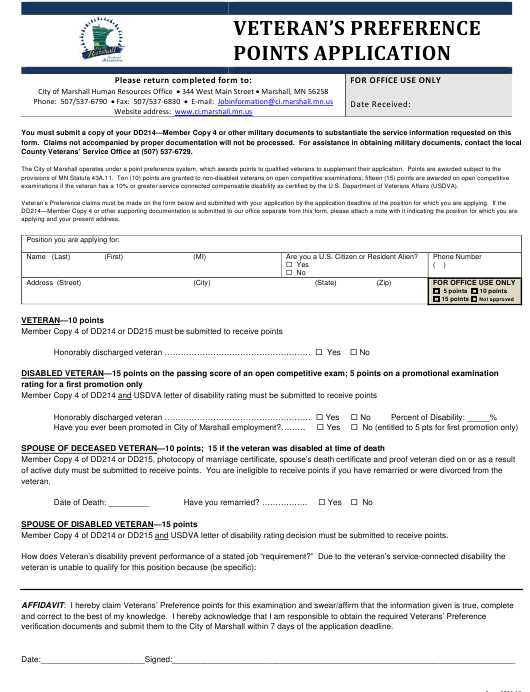 This Minnesota-specific "Veteran's Preference Points Application Form" is a document released by the Minnesota Department of Veteran Affairs. County Veterans’ Service Office at (507) 537-6729.
examinations if the veteran has a 10% or greater service connected compensable disability as certified by the U.S. Department of Veterans Affairs (USDVA). applying and your present address. Are you a U.S. Citizen or Resident Alien? Member Copy 4 of DD214 or DD215 and USDVA letter of disability rating decision must be submitted to receive points. verification documents and submit them to the City of Marshall within 7 days of the application deadline. Minn. Stat. § 43A.11, Minn. Stat. § 197.477, and to certain spouses of deceased or disabled veterans subject to the provision of Minn.
Stat. §§ 197.447 and 197.455.
certified service and verification of “veteran status” granted under U.S. PL 95-202.
general, medical, under honorable conditions. A “DD214 “Member-1” copy will not be accepted. result of, active duty for training purposes does not quality for disabled veteran preference per Minn. Stat. §§ 197.455 and 197.447.
marriage at the time of veteran’s death, and that the spouse has not remarried.